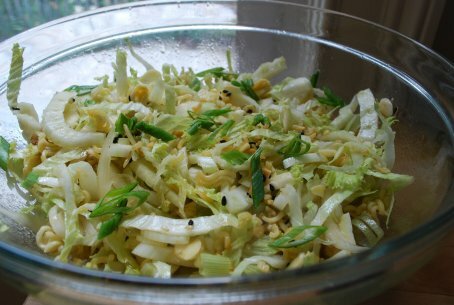 First Came Fashion: Cabbage Crunchy Salad. I could live off of this recipe I love it so much! Mix canola oil, sugar, vinegar, and 2 flavor packets from Beef Ramen noodles, shake up and refrigerate. Next crunch up Ramen noodles and mix with slivered almonds and sunflower seeds and store in airtight container. When you are ready to eat, mix Coleslaw cabbage with chopped green onions, add all the dry stuff, and then toss in the "dressing".